If there is a mama out there who isn't interested in getting her baby to sleep better, we've yet to meet her. Babies can be finicky creatures when it comes to when and where they'll sleep, so it's often all about determining your baby's sleepy time preferences and creating a personalized routine. Here are ten ingredients that might have a place in your baby's optimal sleep recipe. Tiny babies are often interested in sleeping all day and keeping their parents up all night. To help your newborn understand that nighttime is for sleeping, try to keep her awake more during the day. Sing, talk, and play with her after she's fed and changed so she doesn't immediately go back to sleep. Aim for a slighter larger meal at bedtime to help your baby sleep longer before he wakes up hungry. Offer formula-fed babies a few more ounces or if you're breastfeeding, try to nurse a bit longer before you lie baby down. Your baby needs to be tired at bedtime, which is why it's important to prevent an extended afternoon nap. Aim for a longer morning nap and a shorter one in the afternoon to help your baby feel rested during the day but tired in the evening. When your baby wakes up in the middle of the night to eat, change her diaper first. It's possible she'll fall asleep while or immediately after eating, and a diaper change post-feeding could wake her up. If she does need a clean diaper right after she eats, as many breastfed babies will do, do it as quickly and quietly as possible. And use a nightlight rather than turning on a bright light! If your baby wakes up in the night, tend to her needs without talking to her or otherwise engaging--even try to avoid eye contact! You don't want your baby to think this is the time to be awake and playful. Keep your baby's room dark at night and during nap times to help her sleep. Even small cracks of light can be perturbing to sensitive infants; blackout shades are an affordable way to prevent the sunshine from sneaking in. Be sure to pull them open when it's time to be awake and active! It's not always necessary to tend to your baby's every snuffle. Babies and newborns in particular tend to be noisy, and while they're sleeping is no exception: little ones can startle, squirm, fuss, and even cry in their sleep. It's possible your baby might settle down and go back to sleep by herself if you don't swoop in and disturb her. Your baby is a sponge who craves routine, so begin teaching her the signs that it's time to sleep as soon as possible. Around three months is a good time to establish a bedtime routine. Your nap time routine can be a shorter version of whatever you do at night. Maybe your friend had success with cry it out and your cousin swears by attachment parenting methods. But neither of those things will work for you if they don’t fit with your parenting style and lifestyle and your baby’s personality. Rather than listen to others (and that includes experts), really pay attention to your baby and observe what’s she’s telling you. Watch for her signs of sleepiness, get to know her daily patterns and rhythms, and figure out a sleep plan based on that. Teach your baby to put himself to sleep and you'll reap the benefits well into the future. (Rock him to sleep and be prepared to take on the task for months, maybe years to come. It's your choice!) 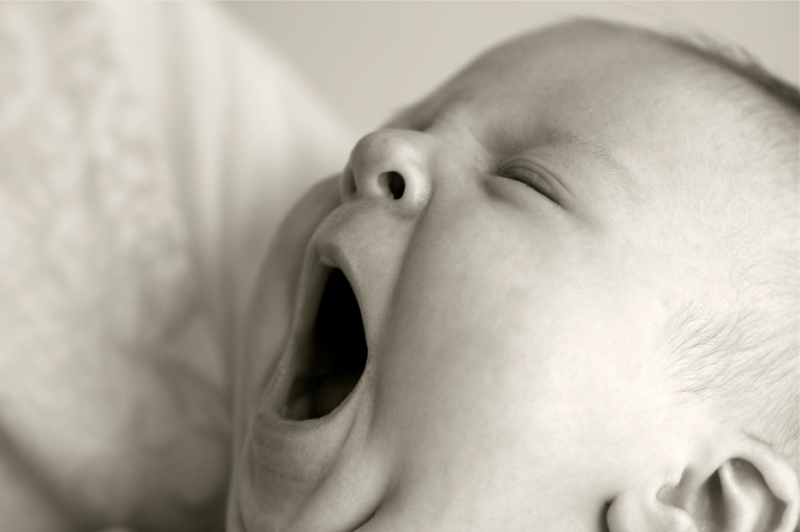 One way to help your baby learn to sleep is by putting him down while drowsy, not dead asleep. It can be tricky, especially if you have a baby who drifts off while eating, but if you can lie him down during that magical moment when he's not asleep but not awake, that's a huge win.